Kent Ridley is an athletic scout and owner of RidleyScouting.com. A service based in Alberta that identifies top athletes in football, basketball, lacrosse, soccer and hockey, helping them acheive their goals of getting noticed by pro scouts. They set up and distribute player profiles, organize scouting systems and do scouting of their own.They’ve recently stepped up their efforts to help bridge the gap between playing professionally and hiring an agent. We met Kent at Grey Cup in Calgary this year, and after following him on Twitter and seeing the knowledge he has about CFL prospects, we asked if he would like to do a piece for BCLionsDen.ca, and he graciously agreed. Hopefully he’ll check in from time to time offering his opinions on the top prospects to watch for possible careers in the CFL. You can’t look ahead without first looking back. For BC that includes 3 draft picks in the first 5 picks of the 2009 CFL Draft. Those three picks turned into running back Jamall Lee, special teams leader/linebacker James Yurichuk and speedy receiver Matt Carter. The Leos followed that up in the third round with a coaches son in big Matt Morencie. In the fourth round they chose safety Tang Bacheyei from Kansas and in the fifth round the final BC pick was Jonathon Pierre-Etienne. So walking out of the draft it looked like BC would be sitting pretty with the non-import talent. However this grouping of seven players only participated in 22 regular season games in Lion colours. Jamall Lee returned from his tryout with the Carolina Panthers to suit up in 4 games with his only scratch on the scoresheet being a 10 yard reception. Given a full training camp and time to learn the playbook completely he will contribute in a much bigger way this year. James Yurichuk suited up in all 18 games and it looks like it’ll be more of the same this year. The next three picks however finished the year in different uniforms. Both Matts (Carter and Morencie) found a road that ended up in Hamilton, while Bacheyei also went to Ontario but into the SkyDome locker room. Finally Pierre-Etienne spent the year on the practice roster hoping to make a big impression on coaches this spring. Now unlike the big spectacle that is the NFL Combine and NFL Draft that follows, which takes up hundreds of hours of programming on various sports networks and sees more folks sign up for NFL Network than any other stretch during the year, the CFL Draft is a different beast all together. Rather than spending a lot of time in analysis of your year ending roster the CFL draft is a lot more of bringing in top non-import talent regardless of need at a specific position. This year you’ll see teams doing weird things based on some formula that they hold to in their war room and on their draft boards. For example last year Montreal drafted 8 players that combined for a total of 8 regular season CFL games and saw 4 of the players picked retire before the season. That all said let’s look to the upcoming camps and see who the Lions might just be bringing to camp this spring. Joe Eppele (Washington State) a 6’8” 306 lb offensive left tackle with Vancouver ties already. Big body that has done well in a program that hasn’t done as well during that time. Has mentioned in previous interviews that he wouldn’t be returning to Washington State for a final season but that door is still open. 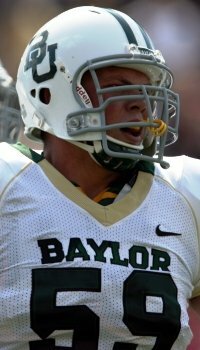 Danny Watkins (Baylor) a 6’4” 310 lb offensive left tackle that is also a BC native. His path is a little different as Danny played hockey growing up and his first game of organized football occurred at Butte Junior College in California while taking forest fire fighting courses. Since getting into the pads all he has done is become a regional all star and has started every game he’s played in 3 years (2 at Butte and 1 at Baylor). John Bender (Nevada) a 6’8” 325 lb offensive right guard that has a knack of taking care of his quarterback. Nevada set an NCAA record with 3 thousand yard rushers this year. Big John was a key to that offensive line that simply pushed defenses around. Shomari Williams (Queen’s) a 6’2” 245 lb defensive force. Spent time at University of Houston as a linebacker but lined up in Kingston mostly as a defensive end. Had a fantastic run through the OUA playoffs, bowl game and Vanier Cup. Cory Greenwood (Concordia) a 6’2” 235 lb linebacker that earned the 2009 CIS Defensive Player of the Year award. Was in on 72 tackles (52 solo and 20 assists) in 8 games and added 2 sacks to the mix. Brian Bulcke (Stanford) a 6’4” 273 lb defensive tackle that entered the 2009 NCAA season as the #1 prospect on the CFL Scouting Bureau Top 15. A broken wrist will send him back to Stanford for a 5th year as he earned a medical red shirt. Otherwise he was a strong bet to go first overall in the 2010 CFL Draft. As a junior he had 18 tackles and 4 sacks in the Pac-10. What would the CFL Draft be without some top receivers. A pair of All-Canadians are leading the pack. Concordia’s other Cory. Cory Watson is an inside receiver coming in at 6’2” and 204 lbs. This second team All-Canadian pulled down 52 passes for 821 yards in only 8 games (1 of only 4 CIS players over 800 yards) with 6 touchdowns. 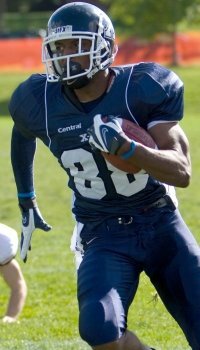 Akeem Foster (St. FX) a 6’5” 208 lb wide side receiver. Perhaps didn’t have the draft year season that grabbed the spotlight but Akeem did snag 37 catches for 595 yards over the 8 game CIS season to earn first team All-Canadian accolades. Another receiver to toss into the mix is Jordan Sisco (Regina). A 6 foot 210 lb receiver that earned an invitation to the annual Shrine Bowl thanks to a 52 catch year for 700 yards. He is a between the 20s receiver though with only 2 touchdowns and a 13.5 yards per catch average for the Rams. For those that need more names here’s an interesting list – Taurean Allen (Wilfrid Laurier, CB); Charlie Houghton (Georgetown, RB); Steven Hughes (Ottawa, WR) and speedy Steven Turner (Bishop’s, RB). With 5 months to the first snap that matters things are very liquid at this point. Look to the National Invitational Combine and the CFL run E-Camp to change positions and no one is a lock. Between the one on one drills for the linemen and the famous 40 yard dash for the ball handlers and ball hawks things will shimmy and shake some more.